Blocking clicks that happen close to the image edge: On mobile image ads, we’ve identified the image border as an area prone to accidental clicks when users are trying to click or scroll to adjacent content. Now, they must click on a more central part of the image to navigate to an advertiser’s website or app. 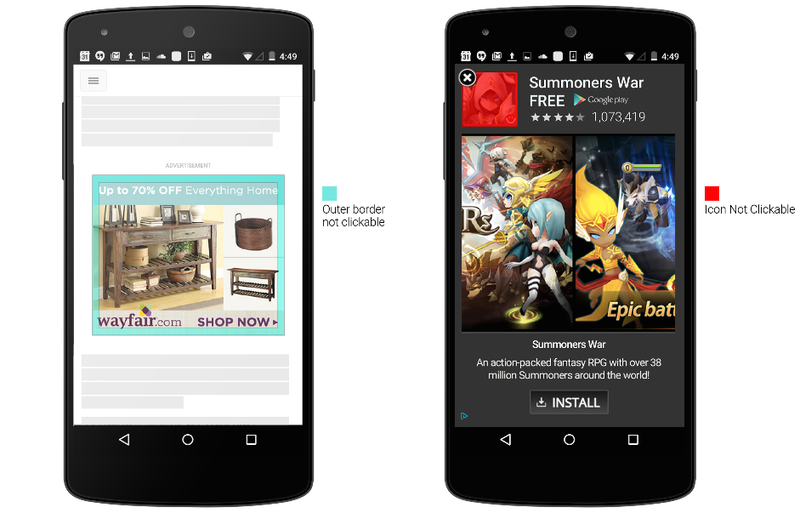 Blocking clicks on the app icon: On in-app interstitial ads, users will no longer be able to click on the app icon of an install ad given its proximity to the ad close button. Instead, users must click on the call-to-action button to visit an app store page and install the app. Adding a clickability delay: Ads will only become clickable after they’ve been onscreen for a short period of time. This gives users enough time to examine the content of an ad and helps eliminate accidental clicks from users who didn’t expect to see an ad. These latest click quality enhancements improve the user experience by keeping them within their desired website or app and not involuntarily taking them to another page. They also benefit advertisers by reducing costs from accidental clicks and improving conversion rates. To date, we’ve seen a 15% average conversion rate lift on display ads by driving more qualified clicks with these updates. In the long run, advertisers can further improve performance by re-investing spend saved from accidental clicks back into their display campaigns. To learn more about display campaigns and ad formats, visit our Help Center and read more on best practices, as well as our latest ad placement policies for apps and websites to maximize click quality. Even as smartphone and tablet screen sizes get bigger, it can be hard for our fingers to keep up. It’s still so easy to click when you mean to swipe or to tap on a link or ad you didn’t mean to. When it comes to mobile ad clicks across networks, recent third party studies estimate that up to 50% of clicks are accidental. For advertisers, this can artificially inflate clickthrough rates and increase costs.